Prototype: German Federal Railroad (DB) class 10 express steam locomotive. Oil tender and main firing by oil included. Model: The locomotive has a digital decoder and extensive sound functions. It also has controlled high-efficiency propulsion. 3 axles powered. Traction tires. The triple headlights change over with the direction of travel. They and the smoke unit that can be installed in the locomotive will work in conventional operation and can be controlled digitally. The running gear lights can also be controlled separately in digital operation. The 72270 smoke unit can be installed in the locomotive. The locomotive and tender are constructed mostly of metal. There is a close coupling between the locomotive and the tender that can be adjusted for the radius of the track. The minimum radius for operation is 360 mm / 14-3/16". Brake hoses are included separately. Length over the buffers 30.5 cm / 12". Highlights: Newly designed cab with an open view through it. Improved locomotive and tender spacing. 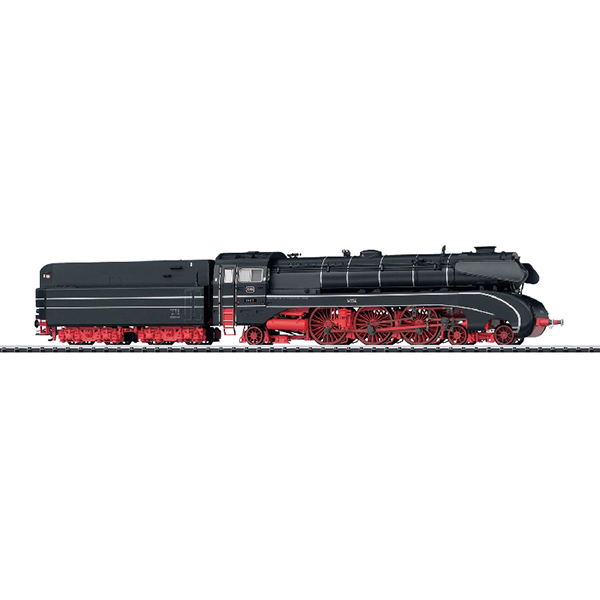 An AC model of this locomotive can be found in the Marklin H0 assortment under item number 37085.